Hank Williams Jr is coming to Kat Country!! and all our rowdy friends are gonna be there! Will you? 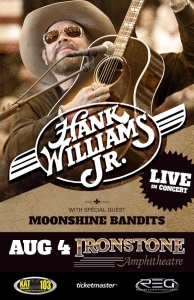 Hank Jr Is comin to Kat Country and he’s bringin some ROWDY friends with him to the Ironstone Amphitheatre Sunday August 4th, 2019!!! Pre sale tickets go on sale Tuesday February 5th. Use the code: FAMILY to buy your tickets before anyone else can! Regular tickets will go on sale Thursday February 7th, 2019!!! Just click on Hank’s handsome face to be taken directly to the virtual box office!